Spring is here! And if the great weather it’s bringing along with it isn’t enough, spring means it’s time for spring break. And what could be better than traveling to escape cold temperatures and get away from the everyday stress of life? Doing it smoothly without delays and boring downtime. Luckily, there are plenty of apps that can help with that. We’re sharing our favorite travel apps, so be sure to download them to your tablet or smartphone before you start to pack! TripIt. Spring break travel requires a lot of planning and reservations: plane, hotel, car and even dinner reservations. TripIt keeps all of those critical reservations in one place, so you don’t have to go searching for confirmation numbers and information each time you check in. iFly. Traveling or having a layover at an unfamiliar airport? iFly is the world’s largest airport app and it includes plenty of critical information including parking information, maps, restaurants, hotel listing, Wi-Fi info and much more. TripTracker. This app is a must-have if you’re traveling to or from areas where there might be extreme weather. It features real-time flight status reports, plus up-to-the-minute itinerary alerts and weather information. Plus, you can store itinerary details like flights, hotel and car rental confirmation. PackPoint. If you are like us and struggle to figure out just how many pairs of tank tops you need for a week in the sun, then PackPoint is the perfect app for you. After you answer a few general questions, the app creates a custom packing list based on the weather, your destination and travel activities. You’ll never again have to wear the same t-shirt three days in a row! Foodspotting. When you’re in an unfamiliar city, picking out a restaurant for meals can be difficult. Foodspotting takes the guesswork out of it and suggests restaurants based on specific dishes, by category, rank or even based on your current location. We’ve got one last item for your pre-spring break to-do list – even if you’re not going out of town: get a new phone case! Nothing says springtime like bright, fun colors and floral prints and a new phone case keeping up with spring trends is an easy way to welcome in the new season. Check out our new floral cases and be sure to get one before your trip! 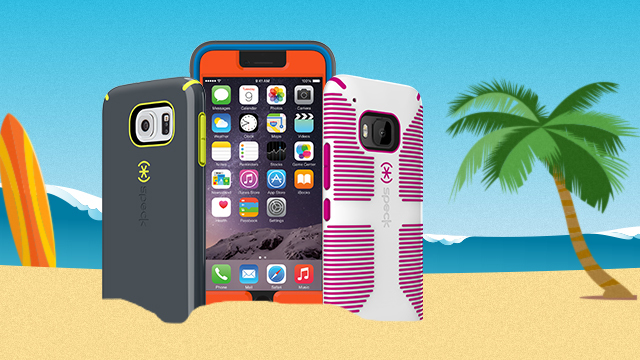 Choose from CandyShell Inked for iPhone 6, iPhone 6 Plus, Galaxy S6, and even more.